Some of the best interactive storybook apps show children that magical leap from the ordinary into a magical world. 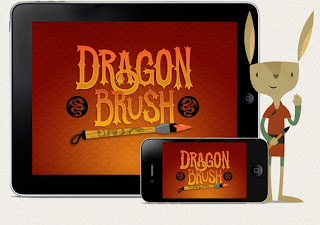 Dragon Brush, a finalist in the 2012 Cybils Book App Award, weaves a story based on a Chinese folktale that keeps children coming back to it again and again. An old woman gives young Bing-Wen a magic paintbrush made from a dragon’s whiskers in this imaginative original story. Bing-Wen uses the paintbrush to paint a chicken to provide food for his family, a tree to grow fruit for the village, and a comical dragon that isn’t very fierce. Children will enjoy wiping their fingers across the screen to reveal intricate paintings that come to life. 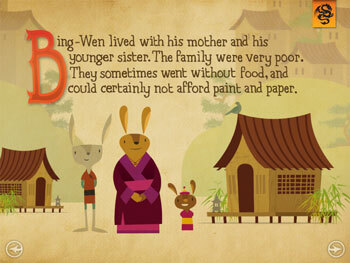 Readers will cheer when the clever Bing-Wen outwits the greedy emperor and teaches him a lesson. Soft guitar music, effective narration, kid-friendly illustrations, and bits of added humor bring a whimsical feeling to this app. A dragon, a greedy emperor, hidden inkpots, and artwork that comes to life…this is an app with kid appeal, for sure! But the story resonates with heart and kindness as Bing-Wen discovers the true gift of artwork - creating a gift for those you love. The artwork, narration and background music complement the story. The characters have a cartoon appeal but the style is restrained and appropriate to the folktale setting in ancient China. As you can see in the trailer, the music and narration by Mark Berninger and Aaron Dessner, of the band The National, gives the app a soothing feel. Dragon Brush from Small Planet Digital on Vimeo. As Andy Hullinger writes on his website, "Sharing a story and bringing the images life with your imagination is a special kind of magic all its own. This is the heart of Dragon Brush, especially if you have an iPad. Be sure to try it together, With a little one snuggled next to you, mute the narration and read aloud for them as they touch and tap to move the story along." My only wish is that the authors provided a little more information about the folktale that inspired their story. I heard about this app but I didn't pay much attention to it and until I read you post, Mary Ann. I think this is the finest children's book app I've seen so far. Kids nowadays are so lucky I guess. Don't you wish we had such app when we were young kids.